New-borns only have peripheral vision and are able to see only variation of light and dark. the baby can briefly catch focus of something up to 3 feet away. the baby should have ability to track moving objects as their depth perception and visual coordination improves – if not fixing and following by this time a paediatrician should be consulted. can see a parent smiling at the other side of a room & can see distance objects out of a window. vision develops quite significantly and is approaching the vision standard for driving! the eyes start to work together and the 3D vision develops enabling better hand-eye co-ordination. Full range of focus, tracking, depth perception and convergence develop up to the age of 8. A child should have their eyes tested at 3, or sooner if there’s a family history of squints / lazy eyes. Vision screening does thankfully occur at Barnoldswick primary schools. However we still see children where they have missed this and if this is the case it is especially important. *An approximate guide to the correct working distance is around that from your shoulder to your elbow. Adults often say to me ‘what can be done for my lazy eye’. The answer is, unfortunately, not much! Any error in the visual development needs to be attempted to be corrected in this ‘critical period’ of infant visual development up to the age of around 8 years old. If your child is at the age where they can communicate, do not rely on them telling you they can’t see properly. Growing up with abnormal vision isn’t unusual for them as they are unaware of anything different. How do they know what is normal vision? Development of their vision is a complex process with several factors besides just visual acuity. Requirements of normal vision include their ability to accommodate (focus), track objects, learn depth perception and to converge. This is something that cannot be fully assessed solely by a parent. If there is a problem, intervention has to occur in the period of visual plasticity; that is up to the age of around eight years old and the sooner the better. 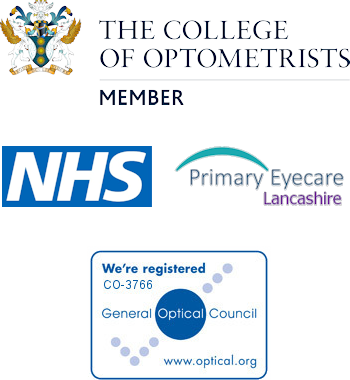 Vision screening at 4 years old does thankfully occur at Barnoldswick primary schools in Reception year. However we still see children where they have missed this and if this is the case it is especially important to have your eyes checked by an optometrist.